Danube River cruises are available from docks in Vienna, Bratislava, and Budapest. The list below provides a basic description of some of the major sites along the river, beginning in Vienna and ending in Budapest. Before departing, be sure to load an iPod with “The Blue Danube” waltz from Johann Strauss (1825-1899). The Danube–With a length of 1776 miles and more than 300 tributaries, the Danube River is one of the most important rivers in Europe. It begins in the Black Forest, is navigable in Ulm, Germany, and empties into the Black Sea. The river flows toward Budapest, so the right bank of the river is on the right as the hydrofoil makes its progress. Vienna–Known to the Romans as Vindobona and to the Germans as Wien, has been a settlement since the time of the Celts. As the capital of the Austrian Empire and later Austria-Hungary, it was the largest German city in modern times. The center of Vienna is not directly on the Danube, although the new buildings between the Danube and the city center are visible from the river. Devín–The first major site on the Danube River past Vienna is Devín Castle. The hill was the site of Celtic settlements, and the Slavs had a castle there since the eighth century. In 1809, as Napoleon was retreating after a battle, he blew up the castle because he considered it a threat. Today, only the ruins survive, although archaeological work on the site is constant, and there is a museum for tourists. Bratislava–The capital of Slovakia is Bratislava, which the Hungarians knew as Pozsony and the Germans called Preßburg. Between 1536 and 1783, it served as Hungary’s capital, which, until the Turkish conquest of 1526, had been in Buda, now part of Budapest. As late as 1919, Germans and Hungarians outnumbered Slovaks in the city, but the position of Bratislava as Slovakia’s administrative capital during the Czechoslovak First Republic (1918-1938) changed the ratio. On the right bank of the river is Petržalka, a bridgehead in what logically would be Hungarian territory that the Czechoslovak government won to protect the city at the peace conferences that ended the First World War. Visible from the river are several sites: 1) the Slovak Parliament, a relatively new building; 2) the castle, which Maria Theresa (reigned 1740-1780) had as her Hungarian residence and carries ceremonial significance today; 3) the cable-stayed SNP Bridge with the UFO restaurant on the top; 4) St. Martin’s Church near the New Bridge, and 5) Kamzík television tower in the hills overlooking the city. Žitný ostrov (Rye Island)–Immediately after Bratislava on the left bank of the river is Žitný ostrov or Rye Island. It is quite fertile and is important for grain production because of frequent flooding. It once had a Hungarian majority, but the number of Hungarians in the area has diminished over time. While there is some tension between Hungarians and Slovaks in the region, Žitný ostrov remains an important political football for the Slovak and Hungarian governments. Gabčíkovo-Nagymaros Dam–Begun in 1977, the Gabčíkovo-Nagymaros Dam has been a bone of contention between the Slovak and Hungarian governments. Before the dam was completed, the Hungarians claimed that it could harm the ecosystem, while the Slovaks maintained that the investment of the two countries in the project, which started during the Communist era, should not be wasted and that the dam protects the towns of Žitný ostrov (see above) from constant flooding. 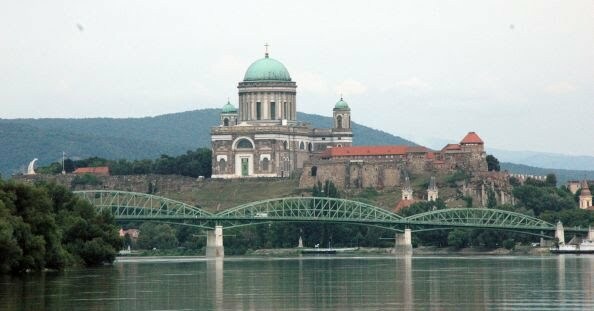 The Basilica at Esztergom with the the new bridge between Esztergom, Hungary, and Štúrovo, Slovakia. Esztergom–Until the fourteenth century, Esztergom served as the capital of Hungary. The city now is the residence of the cardinal of Hungary, and the cardinal’s seat, the Esztergom Cathedral, is the largest church in Hungary. When the Habsburgs liberated Esztergom from the Turks in 1683, much of the city’s castle was destroyed, but all types of renovations began in the eighteenth century. The city still has some Turkish architectural influences. Štúrovo–On the left bank from Esztergom is Štúrovo, once a satellite city of Esztergom and now an important Slovak city. It has a mixed population of Hungarians and Slovaks, and the inhabitants switch languages easily. The Bridge of Slovak-Hungarian Friendship–This is unofficial name for the bridge between Štúrovo and Esztergom. The center segment was destroyed during the Second World War and not rebuilt for decades. Its two remaining segments, one on each side of the river, and the missing span in the center epitomized the tension between Slovaks and Hungarians. The bridge was completed in 2001 with European Union funding, and since both states are in the EU and are members of Schengen, one does not need a passport to cross the bridge. Visegrád Castle–On the right bank of the river not far from Esztergom is Visegrád, temporarily the capital of Hungary in the fourteenth century. Its castle has a commanding view of the Danube, and Vlad III Dracula (1431-1476) of Wallachia was imprisoned there for ten years. Today, it is a conference center and a meeting place for heads of state, including the Visegrád Four, an association of the Czech Republic, Slovakia, Hungary, and Poland. Szentendre (Saint Andrew)–The town of Szentendre, or St. Andrew, on the right bank of the Danube was the home of many South Slavic ethnic groups, and many Serbs came into the town when they fled their homeland during the Austro-Turkish wars of the seventeenth and eighteenth centuries. The town is important not only for its Serb and Orthodox culture but also for its Baroque architecture. Many of the Baroque buildings in Budapest did not survive the Second World War, and Szentendre provides an opportunity for tourists to see an almost untouched Baroque community. Budapest–A settlement from ancient times, Budapest became the city of Aquincum for the Romans. The capital of Hungary in the middle ages, Buda, which is the hilly area on the right bank of the river, and Pest, which is the plain on the left bank, fell to the Turks after 1526 and the Battle of Mohács in southern Hungary. The Habsburgs liberated it from the Turks in 1686, but Bratislava remained the capital of Hungary until the nineteenth century. In 1873, the various parts of the city merged to become Budapest, and at the same time the city became the capital of Hungary.